Many iPhone Xs/7/6 users are facing issue in changing country while making IMO account or login in using the iPhone. Some users report that they are not able to change country code in IMO app after iOS 12 upgrade. The iPhone users in some cases when IMO is not working, does a uninstall of the IMO from the iPhone, But while setting it up again the user can not log in back as user is unable to change the country in iPhone. First it seems as bug in the IMO app, so some users tried to re download the IMO app again and again but still the app does not allows to change the country code eg +1 etc. Clearing application data also does not help to fix the issue. Please note that IMO is dependent on the region of the app store. So if you are not able to change country in the IMO, you should first log out from the app, uninstall it and then change the region of the app. After changing the region you can re-download IMO on your iPhone. It will change the country code to desired. 2. On your iPhone home screen tap Settings > username > iTunes & App Store. 3. Tap your Apple ID->tap View Apple ID. You might be asked to sign in. 4. 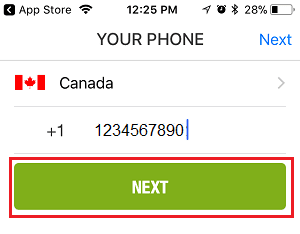 Tap on Country/Region, then tap "Change Country or Region." -> Select your new country or region. 5. Tap Agree in the upper-right corner. 6. Select a payment method and enter your new payment information and billing address, then tap Next. Please note that you have to enter a valid payment method for your new country or region. Now re download the IMO app from the Appstore and correct region/country code will load up. And this way you are able to change country code in IMO app on iPhone.